Wisconsin Governor Scott Walker has refused to implement a state-run health care exchange, defaulting to a federally-run exchange in protest of the federal health care law known as "Obamacare." 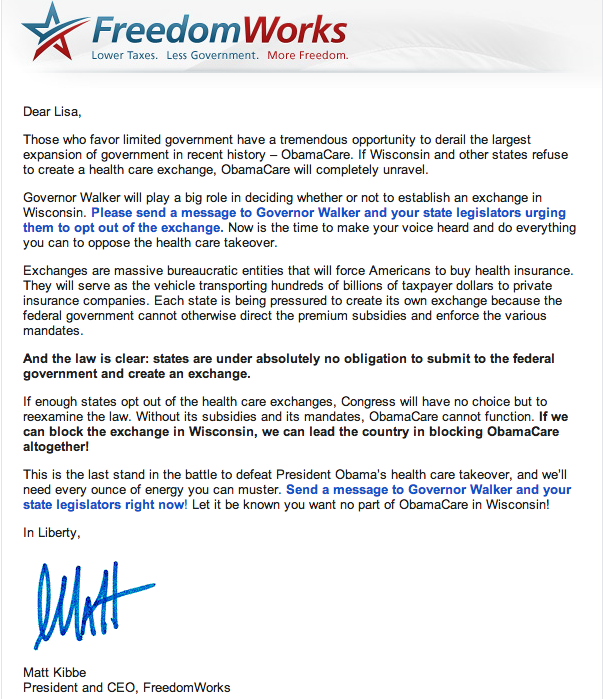 Tea Party groups had pressured Walker to reject the exchanges. In a letter to Health and Human Services Secretary Kathleen Sebelius, Walker rejected the state-run exchange, claiming "Wisconsin taxpayers will not have meaningful control over the health care policies and services sold to Wisconsin residents." Governors had until today, November 16, to declare whether they would implement a state-run exchange or leave it to the federal government. The David Koch-founded-and-funded Americans for Prosperity had been pressuring governors across the country to reject the exchanges, and on Monday, twenty Tea Party groups sent Walker a letter declaring, "The sovereignty of this state and the personal liberty of every single Wisconsinite is at stake -- including the lives of the unborn." "As a significant and highly active portion of your base, we have defended you tirelessly through all of the battles of the last year and a half," the letter reads. "We have done right by you. We now urge you to once again do right by us." Groups like Americans for Prosperity and Freedomworks had also circulated petitions urging Walker to reject the exchange. "It's pretty astounding that we're in a situation where tea party extremists who think we should nullify federal law have more influence with Gov. Walker than every health care advocate in the state," said Robert Kraig, Executive Director of Citizen Action Wisconsin. 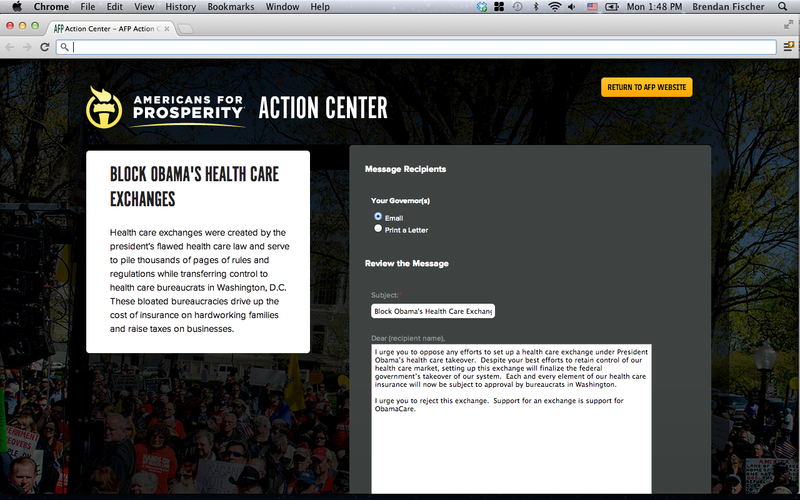 Effort to Undermine Entire Healthcare Law? The online insurance marketplace exchanges are designed to allow individuals whose employers do not offer adequate insurance to shop and compare insurance coverage, with the competition between insurers designed to bring down prices. Families with incomes below 400% of the federal poverty threshold ($92,200 for a family of four) will be eligible for "premium assistance" tax credits from the federal government to offset the costs. As the Center for Media and Democracy has reported, the Koch-founded-and-funded Cato Institute has floated a theory that the health care law was drafted in such a way the tax credits are only available through a state-run exchange, but not a federally run exchange -- and without those subsidies, the law would collapse, since many low-income people could not afford coverage. However, the law as implemented by the IRS provides tax credits regardless of whether an exchange is run by the states or the federal government. Some states have rejected the exchanges on this basis, with Oklahoma filing a lawsuit challenging those IRS rules and arguing the tax credits are only available for state-run exchanges. Most legal scholars expect the suit to fail. Walker did not say whether he was rejecting the exchanges based on the Cato theory, or any other theory designed to undermine the federal health care law. Several Republican governors -- Rick Scott (FL), Bobby Jindal (LA), Sam Brownback (KS), Rick Perry (TX), Nikki Haley (SC), Nathan Deal (GA), Robert McDonnell (VA), Robert Bentley (AL), Dave Heineman (NE), and Sean Parnell (AK) -- had previously announced they would be rejecting the state-run exchanges, but Walker was a key holdout. He was joined in rejecting the exchanges today by Ohio Gov. John Kasich (R) and Maine Gov. Paul LePage, both Republicans. Iowa Gov. Terry Branstad announced that his state would be implementing a state-run exchange (while sharply criticizing the law) as did New Mexico Gov. Susana Martinez. Pennsylvania Gov. Tom Corbett and Arizona Gov. Jan Brewer were allowed to delay their decisions until next month. In Missouri, voters approved a ballot measure on election night giving the decision about creating the state's exchange to the Republican-led legislature, eliminating the chance that Democratic Gov. Jay Nixon might authorize a state-run program. In a statement rejecting the opportunity to develop a state-run exchange, Ohio Gov. Kasich said his state "will not let the federal government take over any regulatory control of its insurance industry." But as The Hill notes, "that's exactly what [the] decision does."